Hyosung Motorbikes which is available in India through their Joint venture with DSK Motowheels Club, have launched GT 250R Signature edition by the hands of Mr. Shirish Kulkarni, Chairman of DSK Motowheels today. Called GT 250 R LE, this new superbike production is limited to just 50 units and is now available for bookings across all Hyosung dealerships in India. 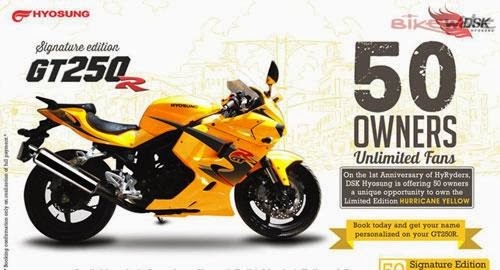 Offered in just one color option of Hurricane Yellow, the new limited edition Hyosung 250 GT R comes with the same engine, a 249cc V twin engine offering 27 PS power at 10,000 rpm and 22 Nm torque at 8,000 rpm. The engine is mated to a five speed Constant Mesh gearbox. The bike can accelerate from 0 to 100 kmph in 8.33 seconds and reach a top speed of 149 kmph. Currently the company sells the bike in three colour combinations - white-red, red-black, silver-red. With the addition of this new limited colour, the bike’s colour line-up looks very attractive and offers a wide range of choice for its customers. Launching limited edition models in India is not new. It is either done to celebrate some accomplishments or sometimes just to clear the inventory. But at the end it’s the Indian consumers who will benefit the most from such launches. Commenting on the launch, Shirish Kulkarni, chairman DSK Motorwheels, said "Driven by popular demand from our discerning customers, we decided to introduce this signature edition of the GT250 R. What better way to introduce this faired beast that the first anniversary of our exclusive superbike club, the HyRyders."